April may be a little early for quality dry fly action on Western Canadian lakes, especially the higher altitude water that is often ice bound at this time of year. However, when fishing chironomids in early season on those occasional warm sunny days, I have noticed good fish periodically rising even though it is still too early for normal Mayfly or Sedge hatches. That is the time when I will switch to a dry line and cast a small clipped hair sedge to try to entice a strike in spite of no apparent hatch! Surprise, surprise, I have been rewarded with a slashing surface strike by a good trout although I must admit, not often in early spring. The clipped hair sedge, whether deer or elk, in my experience, should be part of any well equipped fly fisherman's favorite fly box selection. I believe that elk stands up better to those hard big rainbow strikes but deer hair ties and clips well and is also a good colour in its natural state. Another bonus of this fly is that it floats extremely well even without artificial floatant. Hook : 8 to 14. Body : Spun deer or elk hair. Wing : Wing and body are the same, clipped to shape. 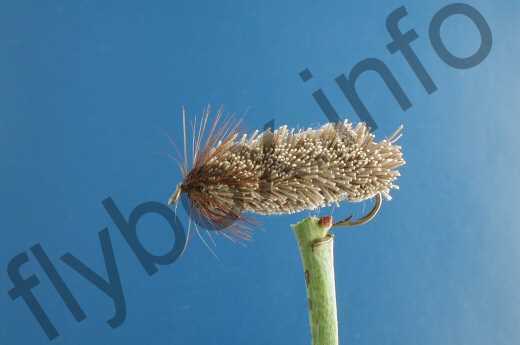 Currently there are no comments about the Clipped Hair Sedge fly pattern from other fly fishermen yet.